This tutorial covers the navigation of an autonomous bot on a grid without obstacles. 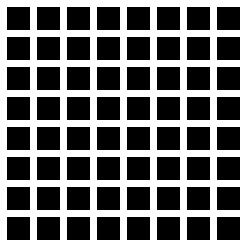 The same code however can be easily modified for a grid with obstacles. An arduino code file is provided at the end. From previous articles we know that the position of the bot on a grid is described by x and y coordinates. Grid following on a grid without obstacles is based on the assumption that a robot can reach any point on the grid if it is able to reach any point lying along the x or y axis from the current position. Now, we know that the movement along x or y axis from the current position will correspond to movement in any of the 4 directions (N, S, W, E). The fact that these directions remain fixed with respect to the grid, even when the orientation of the bot changes, is utilized to take the robot from one point to any other. The building of a grid follower requires a working line follower bot. To detect intersections efficiently we place two additional LED-LDR sensors in addition to the three line following ones. After achieving line following, the bot is made capable of detecting intersections and then turning 90 and 180 degrees at them. Now we move on to the code that will allow the bot to navigate from one point to any other point. For this, firstly a (0, 0) point is fixed on the grid. 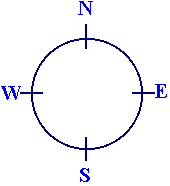 4 directions (say N, S, E, W) are fixed with respect to the grid. The code keeps a record of the bots current position as well as its current direction. Before we start making a grid follower, a line follower is required. In the above code 5 LED-LDR sensors are used for this purpose. To update its current position, our bot is required to detect grid intersections while moving forward. Intersections refer to intersection of white lines on the A.C.R.O.S.S grid while moving forward refers to moving in the same direction that the bot is currently facing. The above function moves the bot forward for a certain number of node intersections. The number of intersections are indicated when a call is placed to the function. An intersection is detected when the extreme left and extreme right LDR sensors are both on the line. The bot stops when the value of temp variable becomes equal to count. In all other cases the bot stops for a while at the intersection, increments temp variable and moves forward. (0, 0) is fixed at lower left corner and directions according to the picture on the right. Thus positive y direction corresponds to N.
Now that we can move along x and y axis, moving diagonally to any point on the grid is possible. For this we simply move the required number of steps in the x direction first then move the required steps in the y direction. It can be vice-versa also.